Would you leave home with your mobile phone charged at 20%? 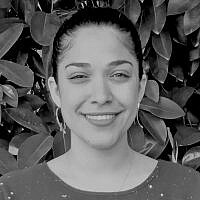 Rotem Yosef is Vice President of Strategic Development for the Israeli nonprofit Nevet. She has a degree in law and a bachelor’s degree in government, diplomacy and strategy from IDC Herzliya. Before joining Nevet, she worked in the Knesset legal department for the labor, welfare and health committee, and founded a volunteer organization called “The Third Generation for the Golden Age,” aimed at teaching computer skills to senior citizens.